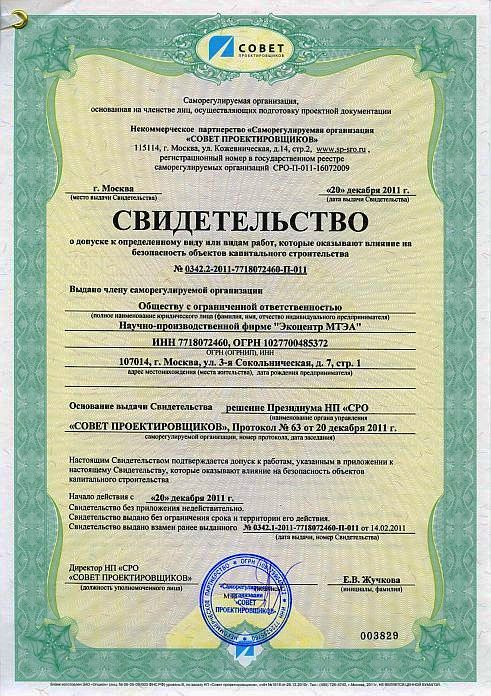 The Presidium of Sovet Proektirovshchikov (Council of Designers, a noncommercial partnership established for assistance in prevention of damage and enhancement of quality in the field of structural design) resolved to reissue to Environmental Centre IFPA Certificate No. 0342.2-2011-7718072460-П-011 of permission to works “Preparation of draft environmental management plants”, which affect safety of capital construction projects including hazardous and highly technical capital construction facilities, except for nuclear energy sites (Minutes no. 64 of 20 December 2011). 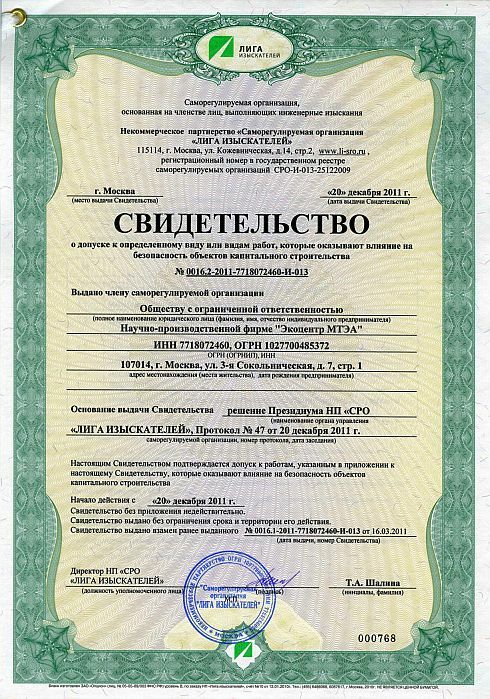 The Presidium of Liga Izyskatelei (League of Surveyors, a noncommercial partnership established for assistance in prevention of damage and enhancement of quality in the field of site surveying) resolved to reissue Environmental Centre IFPA Certificate No. 0016.2-2011-7718072460-И-013 of permission to works on conducting site and environmental surveying which affect safety of capital construction projects including hazardous and highly technical capital construction facilities, except for nuclear energy sites (Minutes no.47 of 20 December 2011).